GOLD, slowly back towards daily MA100! US dollar strenght is melting gold slowly and gold is falling for days, heading towards daily MA100. That level could be a possible turning point for gold at 1135/38, if this momentaly support at 1150/53 breaks. 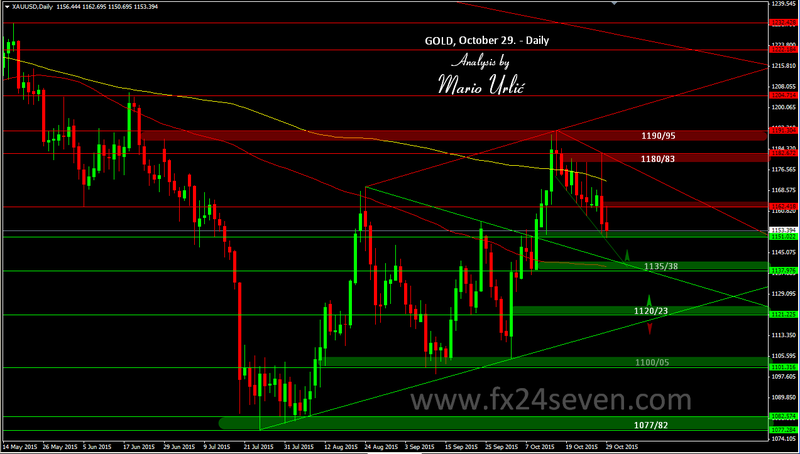 There is several trend lines all over the chart and it’s always interesting for me to analyse and to trade gold, my favorite. On the way up, first resistance is 1160/63, daily MA200 is second at 1172, trend line and 1180/83 as a strong one. On the way down, 1150/53 is the first support in the last two days, 1135/38 is the second and 1120/23 as the strong one. Let’s follow and trade this beautiful shiny metal.